What Is The Relationship Between Education and Money? Here’s the fact, pure and simple—more education means more money and opportunity in the United States. Typically, the higher your education the higher your economic status, power, prestige, and levels of property. 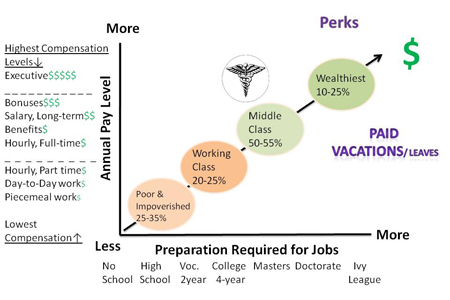 Socio-Economic Status (SES) is a combination of one's education, occupation, and income and has been found to be highly correlated with a better quality of life for those in society who have higher SES scores. 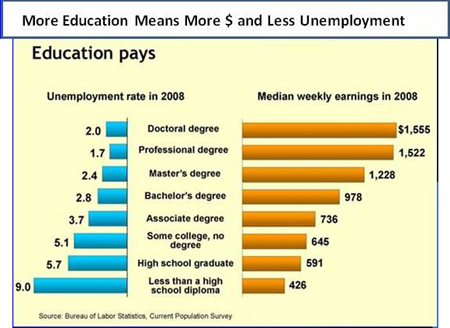 There is more job stability (less unemployment and more pay) for those with higher educations. In Figure 1 below you can see data extracted from the US Census Bureau on this. High school dropouts are more than 4 times more likely to be unemployed than doctoral (Ph.D., Ed.D., MD, or JD) graduates. Four-year graduates (Bachelor’s) make $387 more per week than high school grads. That’s $1,548 per month or $18,576 per year more for Bachelor’s grads. This pattern holds true among all US racial groups and among males and females. A recently published E-article articulated the many benefits of college graduation (see “Education Pays: The Benefits of Higher Education for Individuals and Society” by Sandy Baum and Jennifer Ma; in Trends in Higher Education Series 2007 Taken form Internet on 23 March 2009 fromhttp://www.collegeboard.com/prod_downloads/about/news_info/trends/ed_pays_2007.pdf). Baum and Ma also pointed out that the higher your education the better your medical insurance, health, lifestyle for family and next generation, contribution to society, and more. Education, especially earning degrees, is a doorway to many life-long payoffs to college graduates. You need education because we live in a credentialed society. Credentialed Societies are societies which use diplomas or degrees to determine who is eligible for a job. The key in the US is to graduate every chance you get: a Certificate=1-year past high school; anAssociates=2-year degree; a Bachelor’s=4-year degree; a Masters=another 2-year degree past Bachelor’s; and a Doctorate=another 4-6 years past Bachelor’s degree. Look at Figure 2 below to see the relationship between higher education levels and the “American dream” or “Ideal” lifestyle. Education is the great equalizer and allows the tradition of college attendance and graduation to be introduced into any individual’s personal and family life experience if they so desire and can muster the personal work and commitment along with the resources needed to attend then graduate. Tens of millions in the US have zero, nada, or no medical or health care coverage. Most of them have lower education levels and little to no college education. The extremely poor and disabled may have limited government coverage, but most poor and near poor have no medical insurance. For the most part, working class and middle class people have some level of medical insurance. Interested in a job or career with yearly salary and not hourly pay? Interested in medical benefits and year-end bonuses with paid time off and vacations? Then you need at least a Bachelor’s, Masters or Doctoral degree. Or you may be from the top 10-25 percent of our economic strata that are born into privilege. They get the educational levels, social networking, marriage market, and overall better life chances that only money can buy, including exclusive education, prep-school, admittance into competitive programs, and Ivy League launch pads. Remember Max Weber’s concept of life chances? Life Chances are an individual’s access to basic opportunities and resources in the marketplace. The very few in our society born into extreme wealth have enormous life chances when compared to the rest of us. Can you run for political office without the proper social connections among the country’s power elite? Probably not. Can you become famous or extremely successful without access to extremely well educated friends and associates who are connected to those corporate owners and board members? Probably not. Can you call a friend and get a huge favor for your children with the understanding that someday you will reciprocate back with a huge favor for their children? Probably not, especially if you were born into an average family. You may not be able to change your ascribed status of having been born poor or middle class, but you can definitely change the SES of your own family by choosing to attend and graduate from college. You see, compared to most people outside the US, you and I have it better. You even have it better today than most royalty from just 100 years ago. Look at Figure 3 below to compare your average US life today to the life of European royalty back then.